I would like to understand how it came to be named this. My main issue is reconciling the bridge nomenclature [1,2-a] with the hydrogen nomenclature 1,3,4,6,7,8-hexahydro-2H. I came up with a system that works, but I feel it's likely incorrect. This would explain where the [1,2-a] came from. † (Reasoning at the bottom of post). I have two problems understanding this. It seems pretty non-intuitive to require two separate counting systems. Is that a mistake? 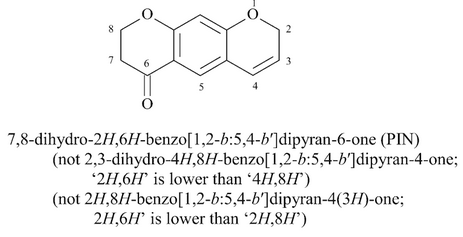 Even if I accept two separate counting systems, the molecule name designates the hydrogen numbers strangely. Based on how I counted the hydrogens, I would expect the name to be 1,2,3,4,6,7,8-heptahydro-pyrimido[1,2-a]pyrimidine. Instead, the 2 position is strangely labeled separately as 2H. That's so strange; it must indicate a mistake from me, right? where it's shown the numbering always starts in the peri position, but it does stop to number the bridge if a heteroatom is there. Interestingly, there's another page on sigma aldrich which names this moleculue as 1,5,7-triazabicyclo[4.4.0]dec-5-ene. This name I can understand, although it does seem to contradict the numbering always beginning at the peri position (it begins with the bridging nitrogen here, presumably to minimize the double bond number to 5). I would assume this name applies to the standalone molecule, and that as a ligand or coordinating compound it uses the pyrimido pyrimidine formulation from above, correct? 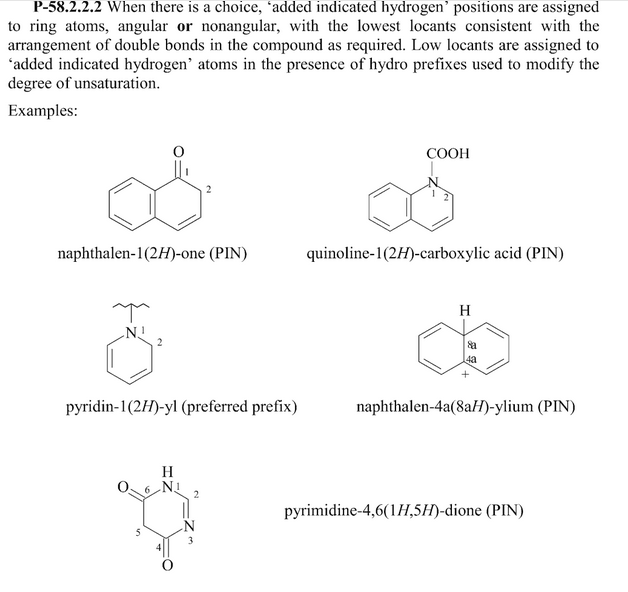 So I managed to find a way to peek directly into the IUPAC book (2013 edition) without having a physical copy via previews on google books. If this isn't allowed feel free to edit it out of my post. The relevant section begins on page 615. You can manually flip to this page by clicking in the top right. I was able to scroll through the entire relevant chapter this way. There's a brief distilled version on the same topic from rsc; relevant pages are 36(d) and 48. At the end of the day, I didn't really understand despite having the IUPAC in front of me. It seems very nuanced, and with no way to check my answer, I don't know if the sigma aldrich source is up to date with the current standard or if I'm just not getting it. In heterocycles deviating from the trivial name (such as pyrimidine, pyrrole, pyran, furan etc), a functional group is demarcated with the H nomenclature. In this context, H actually refers to a locant (ring carbon) in a valence that deviates from the trivial structure. This explains the 2H by the carbonyl in the bottom molecule below (the top molecule follows rule 2 discussed next). However, a greater priority rule also exists. Namely, when a double bond in the trivial structure becomes saturated, the H will be placed here instead. If next to a functional group (such as a carbonyl group), the H will be placed alpha to the carbonyl and not on the carbonyl locant. This can be seen in the first example of napthalen-1(2H)-one, as well as a couple others below. Honestly, I found this rule really tricky, and I'm sure I still don't get it. 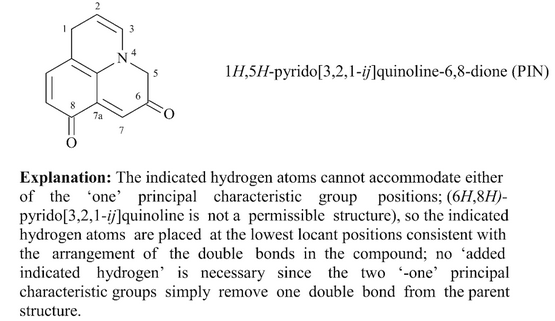 My impression is it's important to draw the trivial structure first to note exactly where the double bonds are. 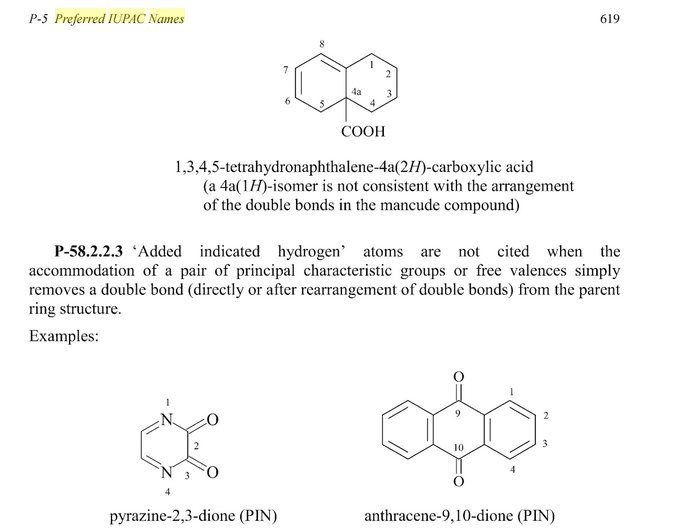 Even though it's a resonance, the precise location of the double bonds matters in the nomenclature, at least that's how I understood the explanation here for 1,3,4,5-tetrahydronaphthalene-4a(2H)-carboxylic acid. 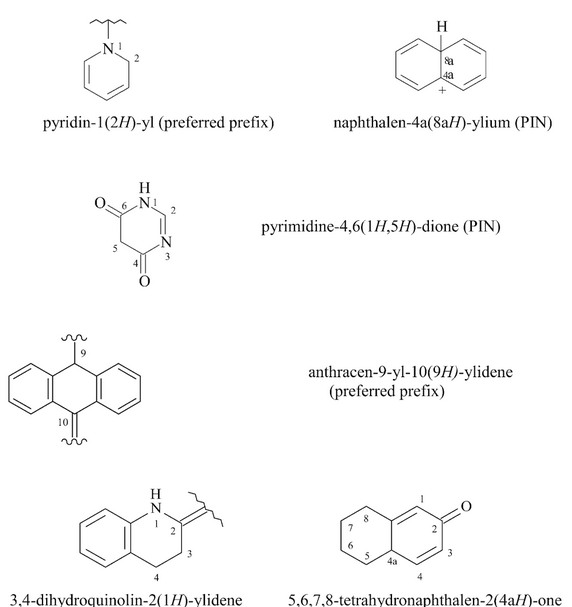 Incidentally, anthracene always follows a numbering pattern with 9/10 in the center aromatic cycle. 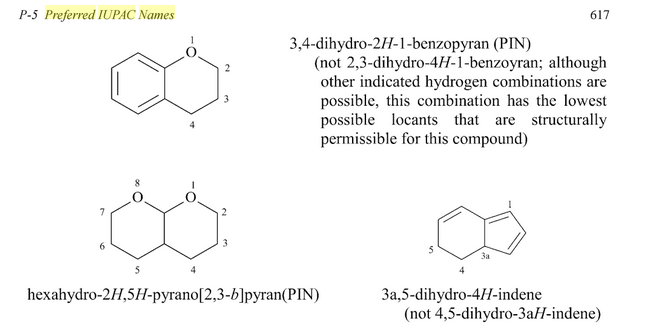 I found 2 other molecules that also followed such a fixed numbering pattern even though it deviates from IUPAC standards for every other heterocycle (I believe one was phenanthrine but I'm not sure). 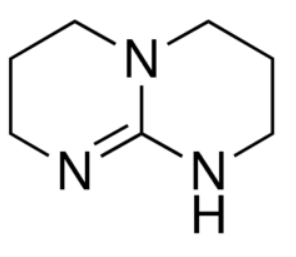 The pyrazine on the left is an example of an exception to case 1. What we see is an example of case 2 above. 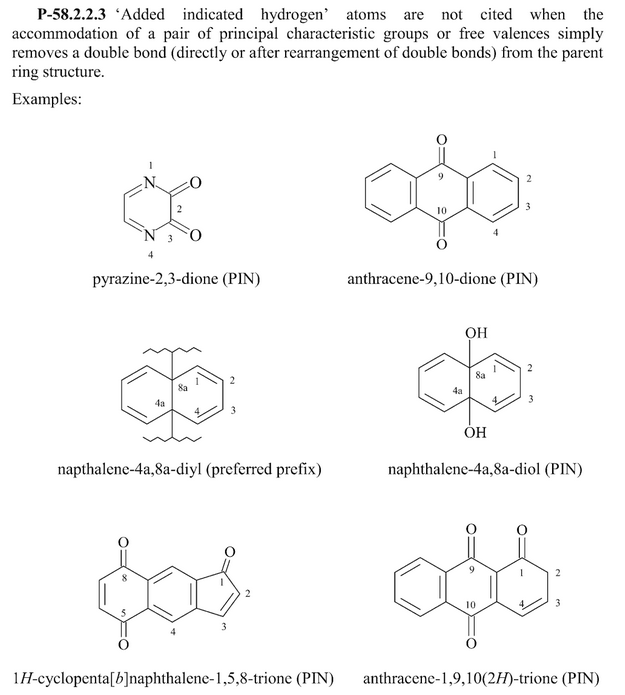 Pyran should have two double bonds in each ring. Each pyran ring is marked with an H in the lowest numbering possible. After that, "hydro" is used for the remaining positions. It seems the H is only needed once, as if it's to announce something has deviated from the trivial structure, and after that normal "hydro" is used. Why my ring, which is a fused pyrimidine, only uses H for one ring and not the other remains a mystery to me. 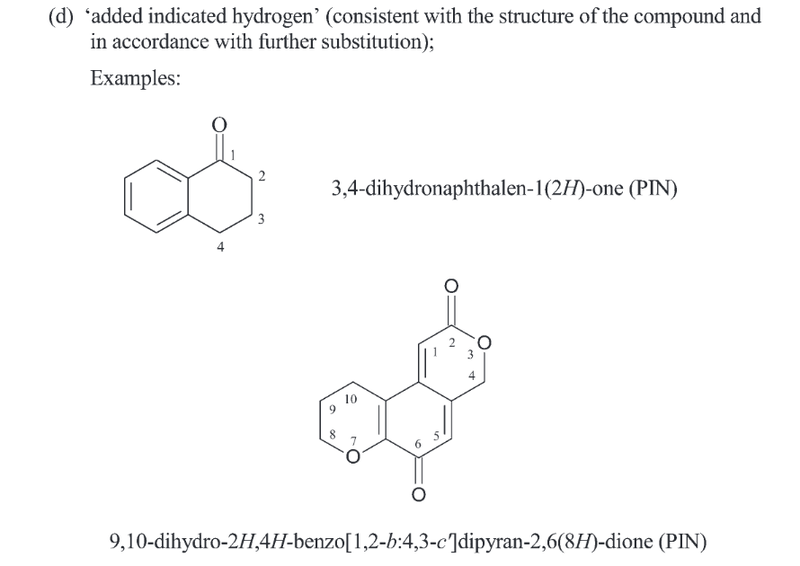 In general, the exact details, from numbering schemes to H assignments, are a mystery to me, like the 5,8 carbonyls not being demarcated with an H in 1H-cyclopenta[b]naphthalene-1,5,8-trione. But, this is as far as I got. Maybe all these examples will help someone else better elucidate the pattern going on here. Browse other questions tagged organic-chemistry nomenclature or ask your own question. 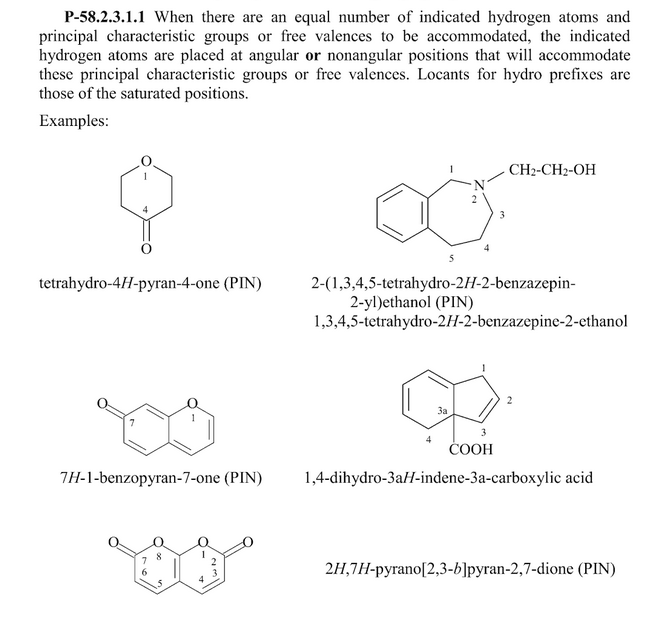 What is the numbering of substituted benzene derivatives according to IUPAC nomenclature? What does the newest IUPAC nomenclature have against unsaturation? Does the priority go for the longer substituent, the closer one, or one which contains a pi-bond in naming Alkenes and Alkynes?